Driver Rupesh presented us with a hefty sack of fresh peas a few days ago. Kim shucked them, blanched them, then warmed them in some ghee with salt, pepper and a pinch of sugar. Verdict: Delicious, with good flavor, a little crunch and a not unpleasant starchiness you don’t often get in peas back home. 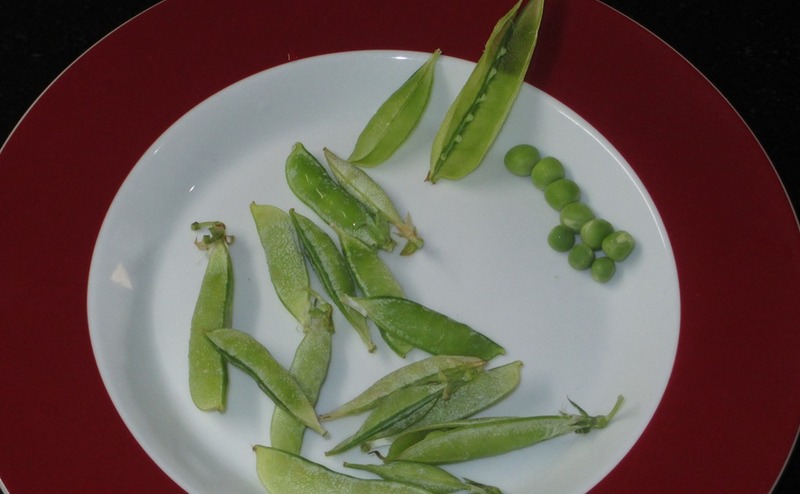 Where did these peas come from? Rupesh uses the phrase I have heard many Indians use, “my native place” – the home village or small town. His family has a farm of a 11 or so acres and there they grow sugar cane, onions, “ground nuts” (ie, peanuts), and peas. Despite decades of modernization, India is still an overwhelmingly farming country – 69% of the population is classed as rural. The vast majority of people you meet here in the cities are one, or possibly two, generations removed from a farming life. You may be a security guard, bank clerk, or an accountant, or an engineer, but your father is/was a farmer, or your grandfather was. The top 3 Indian states in terms of urban population are Maharashtra (which has Mumbai and Pune), Tamil Nadu (which has Chennai) and Uttar Pradesh (which has 7 cities of greater than 1M population, including Lucknow and Agra). Uttar Pradesh – U.P. as typically called – also is the state with the greatest rural population, over 150M. You don’t need to know Hindi to get what’s going on here. A big part of this story is the division of land: The evil brother wants to divide the land and keep his share to himself, the good brother wants to keep the land together and work it in partnership. This very much still happens today and is the main reason the average size of a farm here in India is only 1.3 hectares – a bit bigger than a US football field. BTW, the guy on crutches is Bollywood superstar Pran; his character is “Malang Chacha”, a wise old farmer who is the spiritual advisor to the film’s hero, named “Bharat”, which is the Hindi word for India. Pran passed away only a short time ago at age 93. If you don’t know it, family life is incredibly important in India. When I talk to colleagues and acquaintances here, the conversation always comes round to this topic, with questions like: How many siblings do you have? How are your parents? How did you meet your wife? And so on. My own parents and siblings are scattered from New York to Massachusetts to New Jersey to Georgia to Florida to Texas and to Colorado, and I sometimes think my Indian friends conclude Americans are all solitary cowboys, riding their lonely trails into a variety of sunsets with no connection to hearth and home. From what I have been able to discern of the Indian perspective, by and large family comes first: the wishes of parents are extremely important to sons and daughters, and, being married is close to an absolute necessity for adults here. 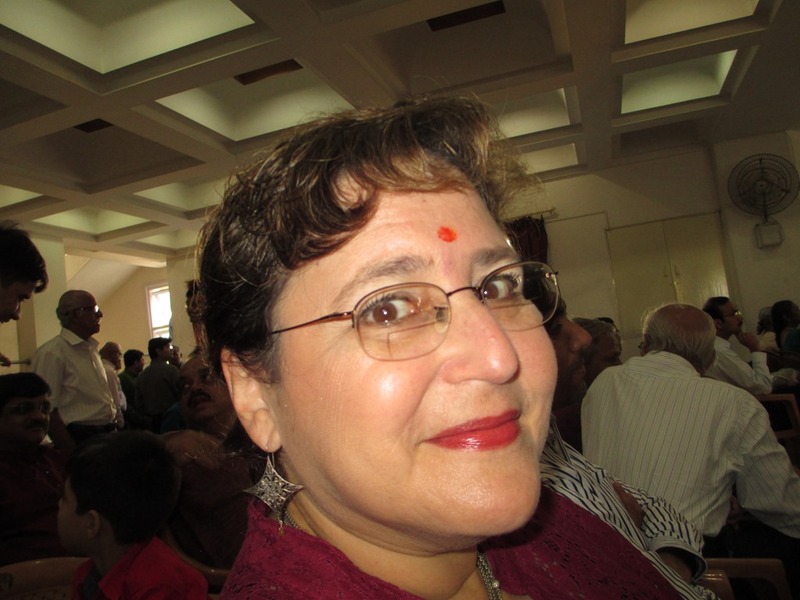 The pressure is so intense that many blogs offer suggestions on excuses to give one’s parents, such as “I am waiting for cousin so-and-so to get married first”, or (a popular one) “I have to complete my advanced degree before I marry” – an Indian parent will never say no to education. Back to the matter at hand, one of my work colleagues, Rahul, invited me to his wedding. I wanted to go not only to celebrate with him, but also out of curiosity. So, on the morning of 15 August, Independence Day here in India, Kim and I put on our best go-to-meeting togs and headed for the wedding hall. First thing to note: the time on the invitation said “9:36 am”. 9:36? Why not 9:30, or 9:35? The reason is because of astrology and numerology – many Indians will not do anything important without a consultation and, if numbers are involved, the luckiest ones must be used. We arrived a tad early at 9:30, hoping not to disturb any in-progress ceremony. The ceremony was in fact already underway, but not to worry, it would have been extremely difficult to disturb the ceremony of this wedding, as the 200 or-so assembled guests were all happily chatting and socializing. Much, much different from a typical Western wedding, where we all silently focus our attention on the wedding couple as they undertake their vows. 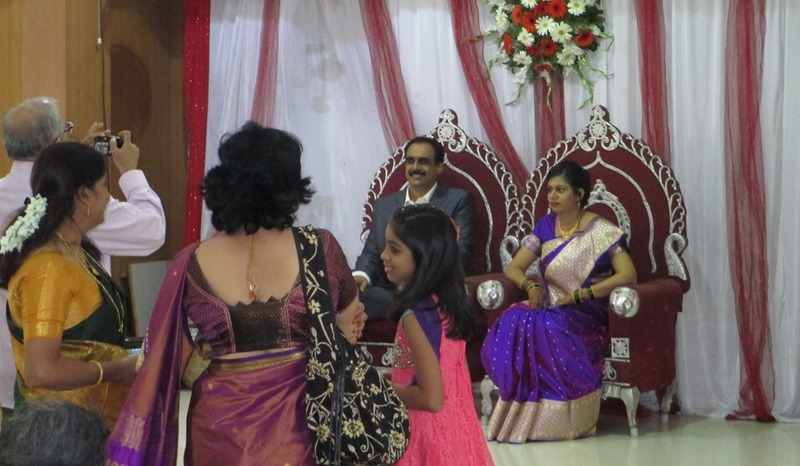 This was learning #1: while the ceremony is important, the wedding is as much about maintaining the bonds of the community as it is about the two principals. 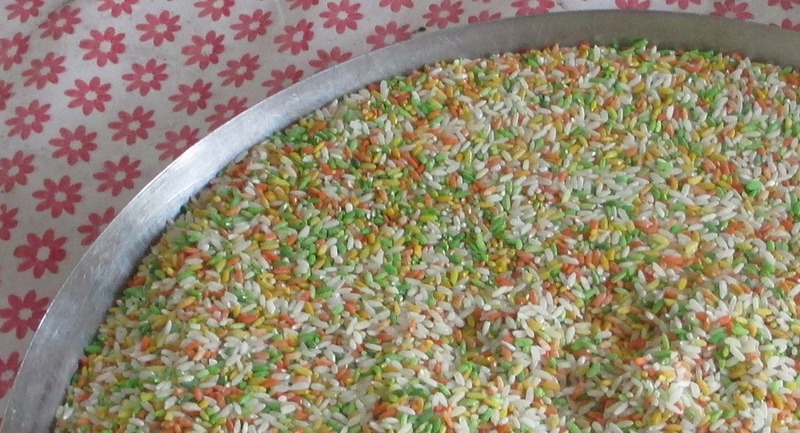 At certain times the other guests would fling pinches of rice in the direction of the bride and groom, so Kim and I supplied ourselves and tossed rice with everyone else. 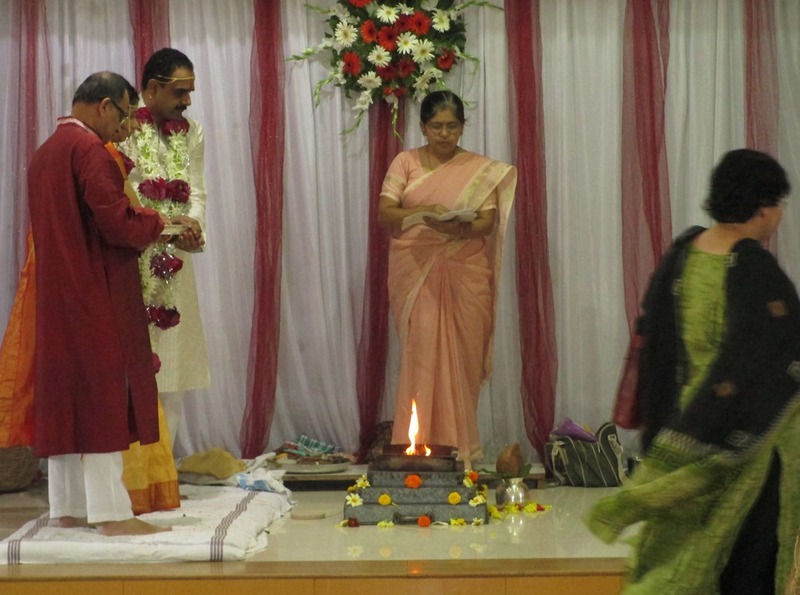 Many offerings are placed in the fire, but the most important part is the saptha padhi or “seven steps” – the bride and groom take seven steps together around the fire, each step representing a different vow. I said these ceremonies can take days? This one did not, but still went around 3 hours which I felt was a goodly time. Quite a lot more went on, including an exchange of a coconut, some blessings from parents, and still other things Kim and I could not follow. 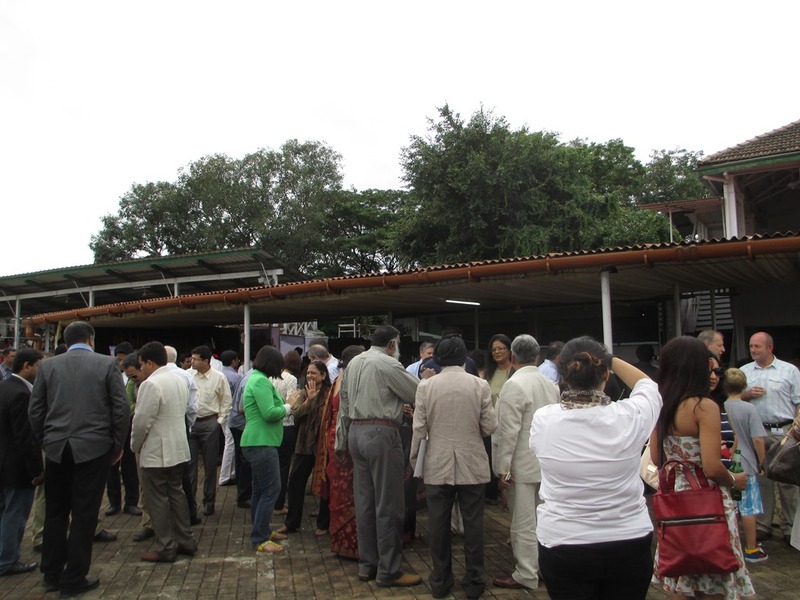 However one thing we did follow, along with all the other guests, was when lunch was declared. 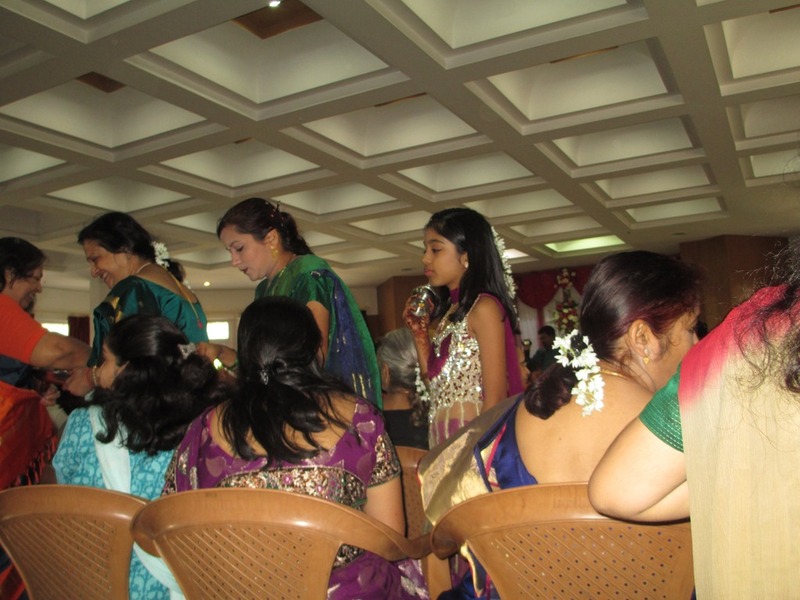 And that was learning #2 about Indian weddings: food matters. Food-wise, Indian hospitality in general is overwhelming, and at a wedding, doubly so. The fare was simple – salad, tomato soup (an Indian favorite), butter paneer, dum alloo (potato curry), several types of pakoras (veg fritters), chapati (flat bread) and bhature (fried bread), plain rice and pulao (veg rice), plus many sweets – but it all was very good and there was a lot of it. Other guests kept pressing us to take more helpings, but after my third helping I had to admit defeat. Then as we were leaving, we saw many more guests just arriving – apparently the lunch is the main thing for many folks here. So, all in all a memorable day for myself and Kim, as I am sure it will be for Rahul and his bride, Ashwini. All the best to them in their life together, and all our thanks for their great hospitality. Śādī kī badhā’ī hō! There are many Hindu festivals in the latter part of the year and today is one: Nag Panchami, a festival that commemorates Lord Krishna’s victory over the nagas – powerful cobra spirits who are generally benign but terribly dangerous if mistreated. The festival is an important one for young women and married women, who make special puja and offerings of milk so that snakes will not attack their families. One reason milk is important involves a legend of a brother who went to fetch some ketaki which is used in the special puja for the nagas; as he searched the brother ironically was bitten by a snake, but he was nursed back to health (or in some versions, brought back from the dead) by the sister, who rubbed his back with milk and ghee. Also on this day, many milk-based sweets are made, such as puran-poli, a kind of sweet roti served with sweetened milk. The motivation for propitiating snakes is easy to see, when you consider that over 45,000 people die in India each year from snake bites. O ketaki flower! Serpents live in your midst, you bear no edible fruits, your leaves are covered with thorns, you are crooked in growth, you thrive in mud, and you are not easily accessible. Still for your exceptional fragrance you are as dear as kinsmen to others. Hence, a single excellence overcomes a multitude of blemishes. Alas, like the ketaki, Chanakya’s excellence seems marred by blemishes. Let’s hope he had a sister who prayed to the nagas on his behalf. 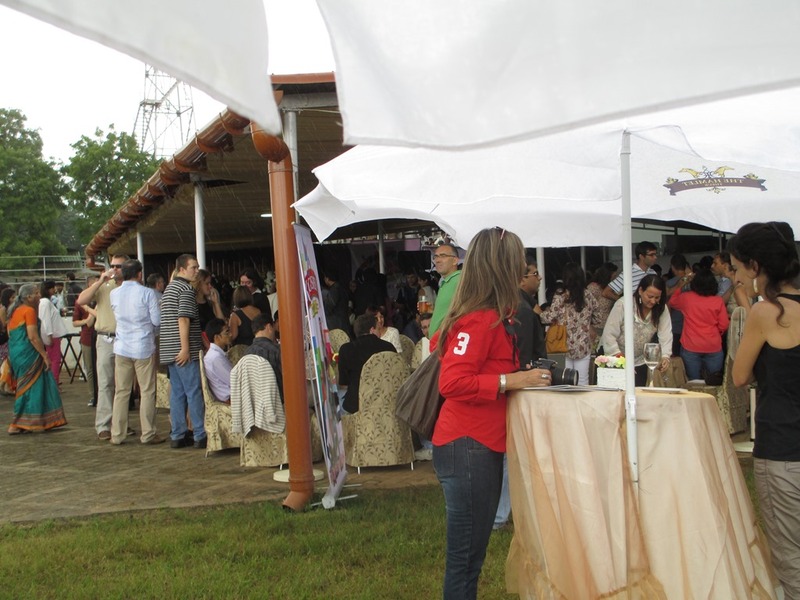 Week before I received an invitation from an expat group I belong to, Everything Expats. Everything Expats provides relocation services for expatriates and as part of that they also maintain a mailing list, host a forum where expats can trade info, and from time to time host get-togethers where foreigners can meet both other foreigners and local folks as well. 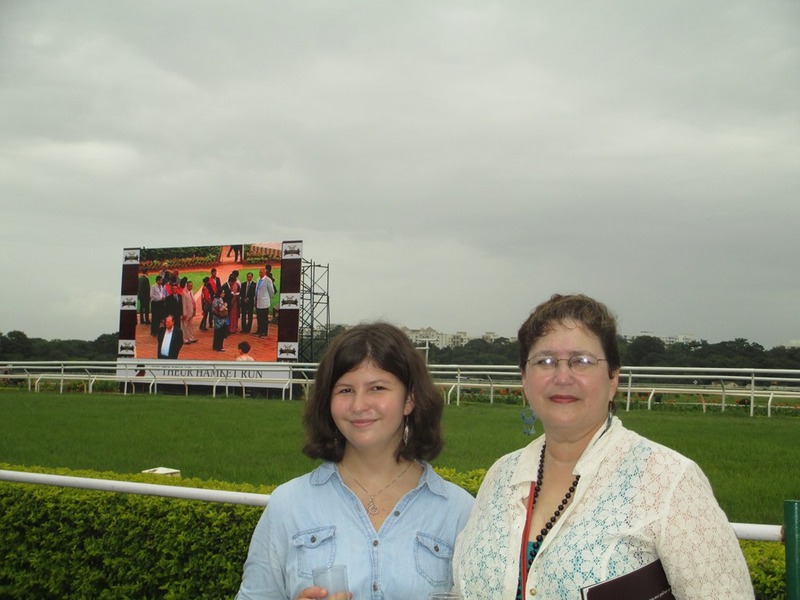 The invite was for the running of the Theur Hamlet Cup at Pune Racecourse on Sunday 4 August. Seemed intriguing, so off we went. Like many things here, the racecourse has an old-timey feel – one could easily picture Nicely-Nicely Johnson, Harry the Horse, or any other of Damon Runyon’s characters placing a bet at the tote window. 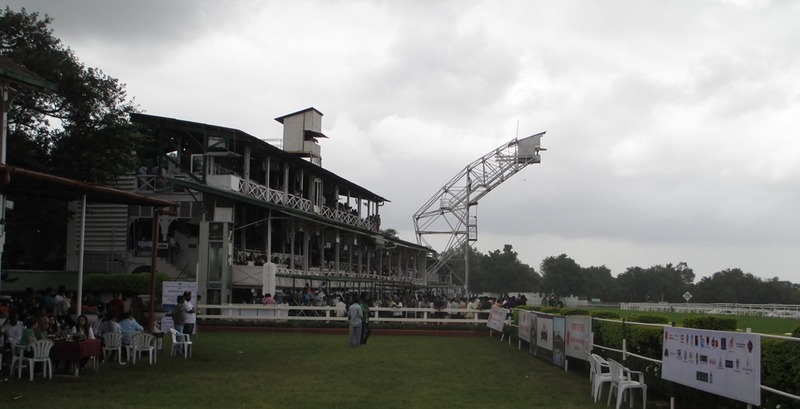 Horse racing has been happening in Pune since at least 1815. 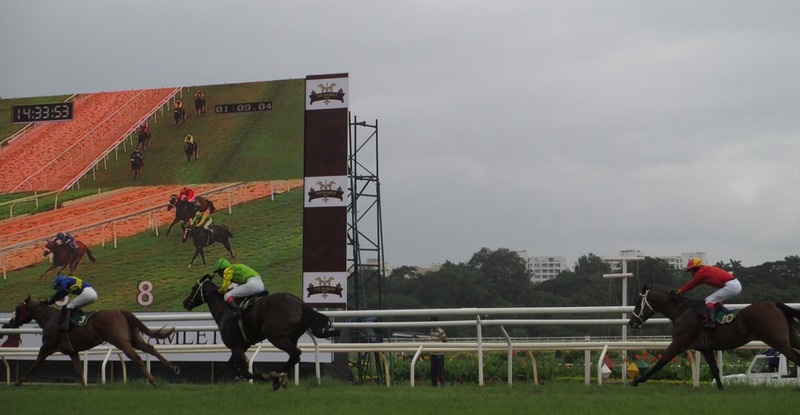 In 1870 a Major General Burnett donated the current race course lands to the West India Turf Club; the race course is in the middle of the Pune Cantonment, a military district established by the British in 1817 and today maintained by the Indian Army. We all noticed that it was the women who did all the fixing; the men just trudged after dragging their rakes and talking. What was the financial upshot of all this? Well, despite losing Rs. 100 on the first race I bet – on a long-shot named Salsa – we had a winner and a placer on the two next races, greys picked by Morgan and Kim named Four-Star General and Hachiko respectively. In the actual Theur Cup race, Mars was the favorite and Fortune Favors the #2. Hoping boldness would be rewarded, I put another Rs. 100 on Fortune Favors to win, but it was not to be. If not for that last bet I would have been up a big, big Rs. 30 (about $0.50). Like many baby boomers I can’t help being fascinated by WW2. The war was a constant subject of TV and movies in my childhood, from Combat to Rat Patrol to Where Eagles Dare to Hogan’s Heroes. As I got older and my taste for actual history grew, I started reading accounts and perspectives of the war. Among the things I read – we are talking 20 years ago or more – was Winston Churchill’s The Second World War, a memoire in 6 volumes. This lengthy work filled me with questions: Who was this man I’d formerly known only as a pudgy cigar-smoker, who shuttled across 4 continents in the midst of the most furious conflict in human history, meeting world leaders and crafting the conduct of the war, all the while downing copious volumes of brandy and painting the occasional water-color? Who was this man who, in addition to his famous remark, “Yes madam, but in the morning I’ll be sober,” also observed, “When you have to kill a man it costs nothing to be polite.”? Who was this great politician who was also a great author, so much so he was awarded the Nobel Prize in 1953? Motivated by these questions, in the 1980s I read the first two volumes of The Last Lion, William Manchester’s biography of Churchill. Entitled Visions of Glory and Alone, they were published in 1982 and 1988 respectively. It would be 24 years until volume 3, Defender of the Realm, would be published, 10 years after Manchester’s death and co-authored by journalist Paul Reid. Though it has been decades since I read the first two volumes, it seems to me the tone and pacing of Defender of the Realm is markedly different. Whether this is due to the change in authorship or the subject matter is hard to say, but DOTR reads much more like a weekly newsreel of the war than an examination of Churchill the man. … we shall fight in France, we shall fight on the seas and oceans, we shall fight with growing confidence and growing strength in the air, we shall defend our island, whatever the cost may be, we shall fight on the beaches, we shall fight on the landing grounds, we shall fight in the fields and in the streets, we shall fight in the hills; we shall never surrender. When we look back at history, events oft times seem pre-determined; we can’t resist the assumption things could not have turned out any other way. But something that comes though, in many places, in DOTR is that things could have turned out much, much different. In movies, of course the Germans always lose. Well, they weren’t losing in 1940. The German army of that time was savage, innovative, and gigantic. Taking no losses of note, the Germans had neutralized and then defeated a combined French, English and Belgian force that numbered in the millions, driving the English to evacuate at Dunkirk. In June 1940 by no means was any victory over Germany pre-determined. Most English expected Germany to invade, and to overwhelm and pacify England just as they had France. In preparation for this, Churchill carried cyanide, intending never to be taken alive by Hitler. The Fuhrer has assumed that invasion would be unnecessary. After the fall of France he considered the war over. In the East his pact with Stalin assured continuing peace as long as neither side abrogated it, which Hitler intended to do once the English came to terms. When Hitler ordered the demobilizing of forty divisions, he told Reichsmarschall Hermann Göring, commander in chief of the Luftwaffe, that all war plans could be scrapped; we would reach an “understanding” (Übereinkommen) with the British. Hitler clearly had no understanding of Churchill and, by extension, of the English. Churchill’s refusal to accept the European common wisdom of accomodation, as manifested by the French with the Vichy Regime, was his great accomplishment. If not for this principled and obdurate stance on Churchill’s part, things would have turned out much, much different, and what seems pre-destined now might never have happened. If you still can’t evade the feeling the outcome of the war was predetermined, try to envision an American president of the last 40 years carrying cyanide and preparing to use it in the case of total defeat. I don’t think so. But their was method to Churchill’s madness. He understood he was waging a global conflict that would set the course of history for a hundred years. To focus on any single thing, a single strategy or a single front, would have led to disaster. Instead he pursued a strategy of many fronts and many activities and was always ready to bolster those that succeeded and stop those that stalled. To concentrate on a single thing was very much what Stalin wanted the Allies to do, in his constant demands to open a Western front. Stalin understood that Germany, arrayed against the combined industrial might of the entire world, could not prevail. His desire was that the Allies spend their strength in head-on encounters with Hitler’s most powerful forces. This would allow Stalin more time and space to expand his own empire, and to insure the forces of the Allies would be depleted when he eventually turned against them. Churchill’s strategy of first confronting Italy and Germany in North Africa, and then in Italy itself – something by no means initially supported by Roosevelt and his advisors – was intended to keep the Nazis off balance, but also to create a presence in the East, so that the Allies could take positions in Eastern Europe when the time was right. From Stettin in the Baltic to Trieste in the Adriatic an iron curtain has descended across the Continent. Behind that line lie all the capitals of the ancient states of Central and Eastern Europe. Warsaw, Berlin, Prague, Vienna, Budapest, Belgrade, Bucharest and Sofia, all these famous cities and the populations around them lie in what I must call the Soviet sphere, and all are subject in one form or another, not only to Soviet influence but to a very high and, in some cases, increasing measure of control from Moscow. Athens alone — Greece with its immortal glories — is free to decide its future at an election under British, American and French observation. The Russian-dominated Polish Government has been encouraged to make enormous and wrongful inroads upon Germany, and mass expulsions of millions of Germans on a scale grievous and undreamed-of are now taking place. The Communist parties, which were very small in all these Eastern States of Europe, have been raised to pre-eminence and power far beyond their numbers and are seeking everywhere to obtain totalitarian control. Police governments are prevailing in nearly every case, and so far, except in Czechoslovakia, there is no true democracy. As writing, I found Defender of the Realm to have a good pace, constantly weaving in Churchill’s views and activities with the unfolding events of the war. The later chapters on Churchill’s post-war life and accomplishments are slower moving, but the links that were made to the younger Churchill – the writing, the socializing, the continued brandy and cigars – all serve to show how Churchill’s authentic self was always there. The war did not make him – he made the war. Smoking a long cigar and stroking his cat, Nelson, he [Churchill] prowled the corridors of No. 10 wearing a soldier’s steel helmet (called by all a “tin hat”), a crimson dressing gown adorned by a golden dragon, and monogrammed slippers complete with pom-poms. Sometimes he carried on anthropomorphic conversations with Nelson (including an admonition to be more stouthearted after the cat flinched in an air raid). Churchill was one of the architects of the modern world, a world where we in the West enjoy the benefits of tolerance, democracy, and capitalism. What have we done with the world Churchill bequeathed us? One answer to that, at least, comes in The New Digital Age, by Google Executive Chairman Eric Schmidt and Google “Director of Ideas” Jared Cohen, a quasi-futuristic view of how information technology will transform daily life around the world in the coming decades. You may recall this book from a previous post of mine, where I quoted Julian Assange, who described the book as an “expertly banalized version of tomorrow’s world”. The future will usher in an unprecedented era of choices and options. While some citizens will attempt to manage their identity by engaging in the minimum amount of virtual participation, others will find the opportunities to participate worth the risk of exposure they incur. Citizen participation will reach an all-time high as anyone with a mobile handset and access to the Internet will be able to play a part in promoting accountability and transparency. A shopkeeper in Addis Ababa and a precocious teenage in San Salvador will be able to disseminate information about bribes and corruption. People who try to perpetuate myths about religion, culture, ethnicity or anything else will struggle to keep their narratives afloat amid a sea of newly informed listeners. Are these guys using the same internet I use? In the cases of Bradley Manning, Edward Snowden and even retired General James Cartwright we see what happens when citizens “participate”. As part of their virtual containment strategies, states will undertake a series of transparency gestures, releasing crumbs but withholding the bulk of information they possess. These states will be congratulated for exposing their own institutions and even their own past crimes … Manufacturing transparent-looking documents and records will not be difficult for these regimes – in the absence of contradictory information (such as leaked original documents) there’s little hope of proving them false. Jared Cohen seems a serious guy – before his Director of Google Ideas gig he was a Fellow at the Council on Foreign Relations, and staffer to both Condoleeza Rice and Hillary Clinton. But I have to say, despite the subject matter he and Schmidt undertake – Identity, Government, Revolution and Terrorism – this is not a serious book. Despite the various cautionary notes like that above, everything in TNDA is too pat, too suffused with the notion that technology always works out for the best. One obvious example that shows how information access is not an unambiguous benefit is climate change. What Schmidt and Cohen would have us believe is, if you are concerned, just Google it and you’ll find the answer. However every reasonable person on the planet knows the “internet” has no such “answer”. What you do find is different sides of the debate using the tactics of the digital world to promote their information and to suppress or discredit contrary information. Does anyone think a regular follower of foxnews.com will suddenly be enlightened by something they read on npr.org? Without getting into my own views on climate change, if you tried to distill down what you get from the internet on this topic into a real answer, it would take years and you would end up being close to a climate scientist yourself. So, yes, it’s faster than checking out dead-tree books from the library. But it is not fundamentally better. Really what this book is, is a commercial for Google. Internet, phones, and information – with tasteful, well-selected ads, of course – is what they sell. And, like a weapons-supplier, they sell their stuff to anyone who can pay. Google wants us to feel everything is fine, and for us to keep giving our information to them, to Facebook, to retailers, and to the government. I don’t think everything is fine. I love tech, I make my living from tech, but no tech is an unalloyed benefit. I do think individuals need to take action, but not by “participating” as Schmidt and Cohen would have it, but by taking control of what they can. An FB friend recently shared a link on this very topic, the Surveillance Self-Defense Project, or SSD. SSD is an Electronic Frontier Foundation project that informs the public on how better to contain personal information. A vast amount of data about each one of us is in the form of “business records” – information that is publically or government-accessible because we have disclosed it, either explicitly or in the context of a transaction. SSD has some good guidance on how to manage all that so you at least know what you are disclosing. It will be efforts like SSD that really enable the benefits that TNDA talks about, not just the raw existence of technology itself. To wrap up, the best I can say about TNDA is that much of what they foresee is indeed possible and to be hoped for – but hopin’ don’t make it so. Perhaps you wonder why I chose to review these 2 books together? Churchill was motivated by understanding of foundational truths, about Democracy, Totalitarianism, Tolerance, Opportunity and above all, about Power. He was an ardent believer in technology – he was the father of the tank, after all – but not bound by it. What would Churchill say to our challenges today, of government transparency, of economic inequality, of worldwide poverty and repression? Would he erect a few cell-towers and make an app for that? I think he would say: Never surrender. Now if you’ll excuse me, I’m going to get my tin-hat and bathrobe. And who knows? when the monsoons abate I may get a few cigars.